I never had a Hamster when I was growing up. I had cats, and in 8th grade I got a dog that ended up being my mom's when I went to boarding school, but I never had a Hamster. Working at a pet store has brought me new respect for many types of animals. I never thought that birds were anything special until I met a baby Macaw about two months old. I've also learned a lot about many types of fish, reptiles and rodents. Something I learned about hamsters is that there are many varieties, and they don't all get along. One of the hamsters that arrived in our store is a solitary type and couldn't be kept in the habitat with the other hamsters. I watched this hamster climb the sides of the small bird cage she was in and admired her acrobatic abilities. Every night when I was doing my closing duties I would take her from her cage and carry her around with me. Finally I decided that this hamster needed to join our menagerie and I brought her home. Scott's statement (after commenting on my insanity) was "We already have a Betta named Won-Ton, is this ANOTHER appetizer for the cats?" 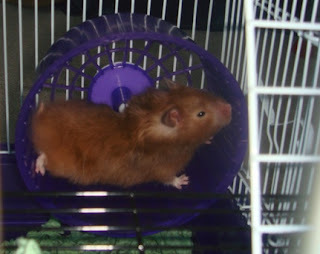 It therefore pleases me to introduce the newest member of our family: Tempura the Hamster.